It has taken me so long to be able to acknowledge my faith in the way I do. Growing up, I did not have any Catholic friends and it felt as though people were always questioning me. They wanted to know why I didn’t eat meat on Fridays in Lent and why I had to confess my sins to a priest in a “little room.” As a kid, I wasn’t equipped to answer these queries. I often stuttered and defended myself the best way I could. It wasn’t until I went to college at a Catholic university that I started to understand the beautiful parts of my faith. 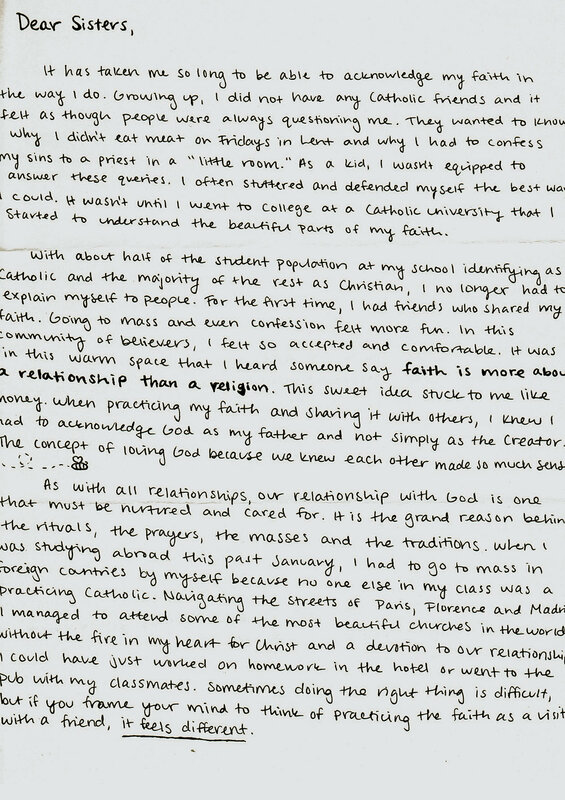 "It has taken me so long to be able to acknowledge my faith in the way I do." With about half of the student population at my school identifying as Catholic and the majority of the rest as Christian, I no longer had to explain myself to people. For the first time, I had friends who shared my faith. Going to mass and even confession felt more fun. In this community of believers, I felt so accepted and comfortable. It was in this warm space that I heard someone say faith is more about a relationship than a religion. This sweet idea stuck to me like honey. When practicing my faith and sharing it with others, I knew I had to acknowledge God as my father and not simply as the Creator. The concept of loving God because we knew each other made so much sense. "I heard someone say faith is more about a relationship than a religion. This sweet idea stuck to me like honey. When practicing my faith and sharing it with others, I knew I had to acknowledge God as my father and not simply as the Creator." As with all relationships, our relationship with God is one that must be nurtured and cared for. It is the grand reason behind the rituals, the prayers, the masses and the traditions. When I was studying abroad this past January, I had to go to mass in foreign countries by myself because no one else in my class was a practicing Catholic. Navigating the streets of Paris, Florence and Madrid, I managed to attend some of the most beautiful churches in the world. Without the fire in my heart for Christ and a devotion to our relationship, I could have just worked on homework in the hotel or went to the pub with my classmates. Sometimes doing the right thing is difficult, but if you frame your mind to think of practicing the faith as a visit with a friend, it feels different. When my non-Catholic friends tell me they accept my religion, but don’t think they could do it themselves, I remind them that behind the rules is a relationship. Even if you haven’t gone to church in years, God is still calling you to Him. He still seeks to know you and love you, even when you aren’t sure you love yourself. I have seen children of atheists devote their lives to God after hearing the story of Jesus Christ. I have witnessed people estranged from the Church come back after so many years. We are drawn to the love God has for us and we want to be known. "Even if you haven’t gone to church in years, God is still calling you to Him. He still seeks to know you and love you, even when you aren’t sure you love yourself. He still seeks to know you and love you, even when you aren’t sure you love yourself ." Sisters, the most profound thing you can do in your faith is say yes to a relationship with God. Say yes to prayer and tell Him all of your hopes and your fears. He listens and he knows. When you look at the way Jesus spoke about the Father, it felt intimate and personal. This is the type of love God has for every one of us too. "When you look at the way Jesus spoke about the Father, it felt intimate and personal. This is the type of love God has for every one of us too." If I have learned anything throughout my nearly 21 years as a cradle Catholic, it is that you are never too far from God to come back home. Nothing you can do will ever cause Him to abandon you. It takes courage to begin again, but when you do, you will start to see His hand in everything around you. My name is Ariel Dorsey and I am a 21 year old student at the University of St. Thomas in St. Paul, MN. As I enter my senior year of college, I am finishing up my studies in Communication and Journalism with hopes to pursue a career that allows me to engage with others using my writing and design skills. I feel God’s presence when I’m in the car singing along to songs on my local worship station or when I’m out on a walk admiring the beauty of His creations. It is in these small moments I hear God’s voice the loudest, usually letting me know I’m right where I need to be. In my free time I enjoy reading as many daily devotionals as I can digest, journaling, golfing, graphic designing and making memories with my friends and family. Some of the silly things I love are green tea, The Office, lavender-scented shampoo, my plain black Birkenstocks and dessert—a glimpse of what my average evening looks like.